In this post we want to explain the basics to chose a wine that will pair perfectly with out suckling pig online. Popularly, It is always said that the meat must be accompained by a red wine. This affirmation is not always true, since we also should have in mind the type of meat and the way it is prepared. Our suckling pig online is a low fat meat. For this reason, the wine selected should have a remarkable acidity. This will help you to get rid of the fat left on the mouth by the meat. Another basic rule of pairing wine could be summed up in this sentence: “If they grow up together, they are eaten together”. 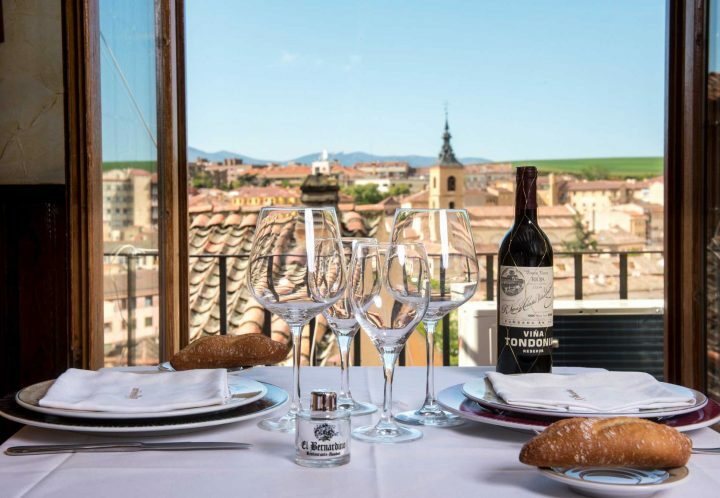 Therefore, we recommend local wines from Segovia and its surroundings. If you rather red wine, then for the suckling pig pairing we recommend a young wine with medium acidity. Crianza wines can turn out to be too heavy because of its low acidity and high density. A good option would be D.O.P Valtiendas, which is made in part of the province. Also D.O Ribera de Duero is made locally with a wide offer of young wines. However, if you prefer a white wine, it will perfectly pair the suckling pig as well, so do not hesitate to try it. The D.O Rueda wine, also from Segovia, is a good choice, since it is quite acid. If you want to try something a bit different, the sparkling white wine, such a good cava is another good option, since the carbon dioxide it has will clean the mouth as it passes by, so the fat of the pig will not be so noticeable. We hope you find the perfect pairing for our suckling pig with our suggestions.